Although AutoRun may not be entirely categorized as being anti-malware, it useful for some applications. AutoRun Exterminator has been created to protect in real time computers against viruses using the file "autorun.inf" in pen drives. Once downloaded and installed, AutoRun Exterminator begins to monitor all logical drives and tries to detect "autorun.inf" in the drive root. Every part of the computer system will be scanned to find any kind of threats. After the scan, AutoRun Exterminator will send a complete report to the user. Indeed, found and excluded "autorun.inf" files will be displayed. Results are displayed as icon in the System Tray located near the Windows clock. Just after you receive the report, you are going to be asked to eliminate or not found files. It is worth to note that "autorun.inf" files are automatically deleted by the software to allow a protection at hundred percent. Some problems have been fixed with this latest version. Among them, we can note that it is possible to view the activity log when the autorun.inf were found and deleted. Users can also discover option to start the application with Windows. 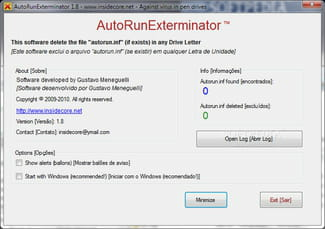 AutoRun Exterminator is easy to use. For a complete protection, AutoRun Exterminator also disables the Autorun Windows feature. Latest update on July 23, 2017 at 05:16 PM.